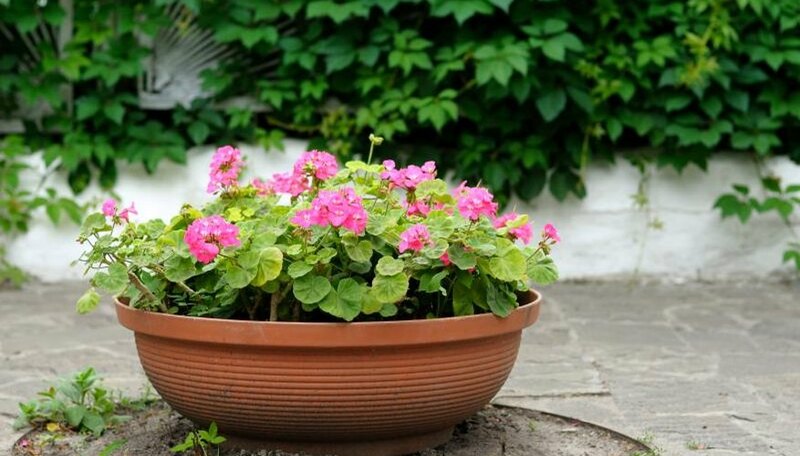 The common name "geranium" is given to a variety of garden plants, including herbaceous perennials and four different groups of flowering annuals. Each of these different types of geraniums has a unique character that makes it suited to a particular role in the garden. Cranesbill geraniums are herbaceous perennials that grow in temperate areas around the world. These plants are in the genus Geranium, as opposed to the annual gernaiums, which are in the genus Pelargonium. Most garden varieties of cranesbill are true to their modest wildflower roots, with single flowers in shades of white, pink and purple, and they grow in mounds of deeply lobed leaves. The Himalayan cranesbill geranium (Geranium himalayense) is a purple-flowered variety that is hardy in U.S. Department of Agriculture plant hardiness zones 4 to 10. The bloody cranesbill (Geranium sanguineum) is a pink variety that is hardy in USDA zones 3 to 8. Zonal geraniums (Pelargonium × hortorum) are hybrids of Pelargonium inquinans and Pelargonium zonale. They are usually grown as annuals, although they are winter hardy in USDA zones 10 to 11. The plants form upright mounds between 1 and 3 feet high, and their leaves are usually oval- or kidney-shaped, often with scalloped edges. The plant's common name comes from the fact that its leaves are often divided into zones of distinctly different colors. The flowers of zonal geraniums are carried in dense clusters atop flower stalks and may be single or double. Ivy-leaf geraniums (Pelargonium peltatum) are also typically grown as annuals, but they, too, are winter hardy in USDA zones 10 to 11. These plants are distinguished by their leaves, which are thick and waxy, and their growth habit, which is trailing and vine-like. Ivy-leaf geraniums are often grown in window boxes and hanging containers, from which their stems may trail as far as 3 feet. The flowers of ivy-leaf geraniums, which may be single or double, also tend to form in clusters that are less dense than those of zonal geraniums and have narrower petals. Regal geraniums (Pelargonium x domesticum) are hybrids of Pelargonium grandiflorum and Pelargonium cucullatum, and like other Pelargonium geraniums, they are hardy in USDA zones 10 to 11. They are also commonly called Martha Washington geraniums. The distinguishing characteristics of regal geraniums include their woody stems and shrubby growth habit; they may reach up to 3 feet in height. They have oval- or heart-shaped leaves with crinkly, toothed margins. Regal geraniums are less heat tolerant than other Pelargonium species, and they will only flower reliably if they're exposed to cool temperatures at night. Because of their sensitivity to heat, they are often grown as potted houseplants rather than in the garden. Scented-leaved geraniums are usually grown for their aromatic foliage rather than for their flowers. They are hardy in USDA zones 10 to 11, but they, like the other Pelargonium species, are typically grown as annuals. The leaves of these varieties produce a strong fragrance when they're brushed or rubbed between the fingers, and they are commonly grown along paths where their scents are easily discernible. The character of the scents varies from species to species; Pelargonium graveolens, for example, smells like roses, Pelargonium crispum like lemons, and Pelargonium tomentosum like peppermint. What Is Wrong With My Geraniums?